Gambling addiction, also called compulsive gambling or pathological gambling, is an irrepressible urge to gamble, regardless of the negative impact that gambling may have on your personal, professional or financial well-being. 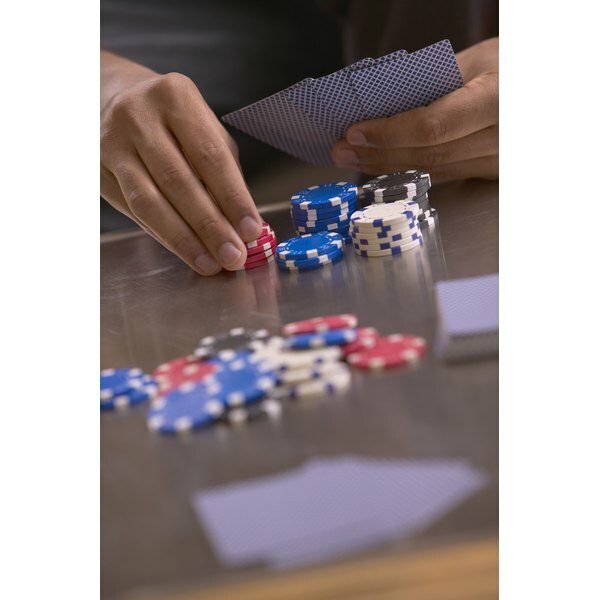 Gambling addiction is a chronic condition, similar to alcoholism or drug addiction, according to Medline Plus. The National Council on Problem Gambling estimates that 2 million Americans, or about 1 percent of the population, are pathological gamblers. An additional 2 to 3 percent, or 4 to 6 million people, would be considered problem gamblers, people whose gambling affects their everyday lives. According to Medline Plus, men tend to exhibit signs of pathological gambling in their early teens, while women begin a little later: between the ages of 20 and 40 years old. However, gambling addiction can affect a person of any age. "The Diagnostic and Statistical Manual of Mental Disorders IV" lists 10 criteria for diagnosing pathological gambling; the presence of five or more characteristics indicates a gambling addiction. These criteria include a preoccupation with gambling; the inability to stop gambling, despite the best efforts; irritability when trying to cut back on gambling; the need to wager larger sums; gambling to relieve stress or escape from problems; constant attempts to "break even" or recover losses; lying to others about the severity of the gambling problem; relying on others for money to relieve gambling debts; risking personal or professional relationships due to gambling; and committing crimes to enable gambling. Compulsive gamblers may suffer from mental disorders such as depression and anxiety, according to Medline Plus. Gambling addicts may also abuse drugs or alcohol or attempt suicide. The financial strain may lead to bankruptcy, job loss and the alienation of friends and family. The article "The Effect of Pathological Gambling on Families, Marriages, and Children" from "CNS Spectrums" states that the divorce rate is significantly higher for gambling addicts and that the rate of domestic violence is higher in families with pathological gamblers. Medline Plus states that pathological gamblers often resist treatment and are in denial about having a gambling problem; most gambling addicts consent to treatment only after being pressured by family or friends. Gamblers Anonymous offers a 12-step program and support group similar to that offered by Alcoholics Anonymous. Cognitive behavior therapy may also help a gambling addict to recognize the problem and stop gambling. Medline Plus indicates that compulsive gamblers may relapse during treatment, but that pathological gambling is not an insurmountable disorder.